HONOLULU—The Mamoru and Aiko Takitani Foundation, Inc. has awarded $111,000 in scholarships to 66 exceptional seniors from every qualifying public and independent high school in Hawaii as part of its Legacy Scholarship Program. Three students were recognized with scholarship awards totaling $28,000. Two students received Distinguished Student Awards of $10,000 each and one student received an Outstanding Student Award of $8,000. Ten high school seniors received $3,000 scholarships as district finalists and 53 students were awarded $1,000 scholarships. Nominated by their respective schools, the award winners received scholarships based on their strong academic achievement, dedicated community service and financial need. 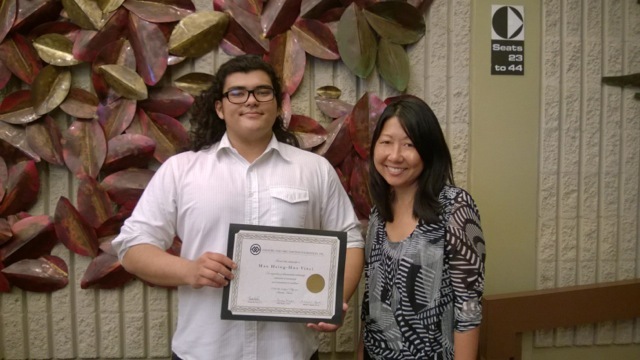 Moses Bae of Roosevelt High School was awarded the Mamoru Takitani Distinguished Student Award of $10,000 and will attend Notre Dame University in Indiana this September. He is the son of Jongdo Bae and Sungia Kim. Vivien Chen of McKinley High School received the Aiko Takitani Distinguished Student Award of $10,000. Chen is the daughter of Jane Yi Chen and will enroll at the Franklin Olin College of Engineering in Massachusetts in the fall. Arianna Claveria of Kapolei High School was the recipient of the Karen Uno Outstanding Student Award of $8,000 and plans to attend Washington State University in the fall. Claveria is the daughter of Fred and Felonila Calveria. Erin Evangelista of ‘Aiea High School. High School. She is the daughter of Erwin and Aileen Evangelista. Jacob Chang of Mililani High School. He is the son of Aaron and Melissa Chang. Sally Millon of Waipahu High School. Her guardians are Ceferino and Francisca Pactanac. Alexa Anderson of Kalaheo High School. She is the daughter of Mark and Janet Rupp. Erin Morikawa of Waiakea High School. She is the daughter of Lane and Lisa Morikawa. Cendall Manley of Moloka’i High School. She is the daughter of Randolph and Louise Manley. Alexis Hawks of Kapa’a High School. She is the daughter of Brett and Laura Hawks. Jamie Advincula of Maui Preparatory Academy. She is the daughter of Juan and Dominga Advincula. Skye Waipa of Parker School. She is the daughter of David Waipa and Lisa Siu. Huy Nguyen of Damien Memorial School. He is the son of Hien and Ngoc Nga Nguyen. Honolulu District: AJ Clifford Alcover of Farrington High School; Emily Wong of Kaimuki High School; Ria Oba of Kaiser High School; Yiju Huang of Kalani High School and Courtney Hiraoka of University Laboratory School. Central O`ahu District: William Smisek of Leilehua High School; Gina Watanabe of Moanalua High School; Juliya Key of Radford High School and Ashley Nakoa-Kawahakui of Waialua High and Intermediate School. Leeward O`ahu District: Brandon Lorezco of James Campbell High School; Clifford Cunningham of Nanakuli High and Intermediate School; Kiara-Lin Wasano of Pearl City High School and Kylee-Ray Burgess of Waianae High School. Windward O`ahu District: Jewels Oliquiano of James B. Castle High School; Tuiluaai-Ofa Roberts of Kahuku High and Intermediate School and Pablo Furukawa of Kailua High School. Hawai’i District: Kaimana Kawaha of Hilo High School; Dejan Perez of Honoka’a High and Intermediate School; Deisha Gascon of Ka’u High School; Eve Paguirigan of Kea’au High School; Sabrina Pike of Kealakehe High School; Yuki Zbytovsky of Kohala High School and Christoper Bartolome of Pahoa High and Intermediate School. Maui District: Nohea Stoner of Hana High School; Julia Kimoto of Henry Perrine Baldwin High School; Casey Hearl of King Kekaulike High School; Haleigh Berko of Lahainaluna High School; Nicholas Niimi of Lana’i High and Elementary School; Alssie Casayuran of Maui High School and Joseph Baldwin of Kihei Charter School. 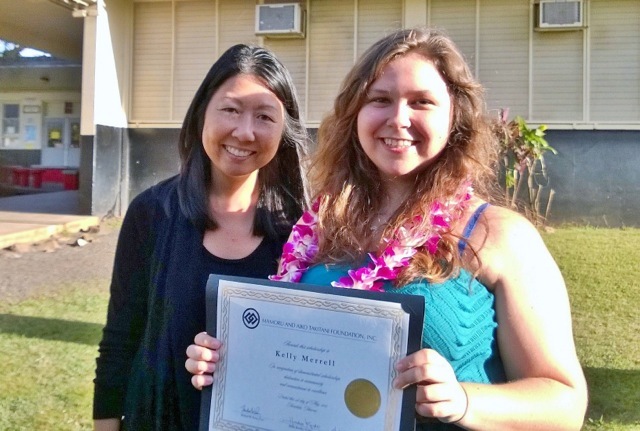 Kaua`i District: Caitlin Telles of Kaua’i High School and Tiffany Ishibashi of Waimea High School. Hawai`i Association of Independent Schools (HAIS): Jonnisty Monalim of Hanalani Schools; Sydney Suzuki of Hawai’i Baptist Academy; Hadley Beach of Hawai’i Preparatory Academy; Natalia Hayakawa of ‘Iolani School, Marc Delucchi of Island Pacific Academy; Emma Schneck of Island School; Raiden Domingo of Kamehameha Schools – Hawai’i; Nike-Michelle Tolentino of Kamehameha Schools – Kapalama; Mauliola Gonsalves of Kamehmeha Schools – Maui; Kristiana Petrie of La Pietra Hawai’i School for Girls; Taylor Souza of Le Jardin Academy; Destiny Jarrett-Stroud of Makua Lani Christian Academy; Nora Viarnes of Mid-Pacific Institute; Kassidy Kanja of Punahou School; Berry Beadles of Seabury Hall and Rachel Ho of St. Andrew’s Priory School. Hawai`i Catholic Schools (HCS): Vincent Nguyen of Maryknoll School; Maya Waldrep of Sacred Hearts Academy; Micah Leval of Saint Anthony Junior-Senior High School; Isaac Crichton of Saint Francis School and Quinton Matsuo-Chun of Saint Louis School.